^ Rose, Melinda (October 2008)． Helium: Up, Up and Away?． For a more authoritative but older 1996 pie chart showing U.S. helium use by sector, showing much the same result, see the chart reproduced in "Applications" section of this article. ^ Connor, Steve. Why the world is running out of helium. The Independent (London). 23 August 2010 [2013-09-16]. ^ Siegel, Ethan. Why the World Will Run Out of Helium. Starts with a Bang. Scienceblogs.com. 12 December 2012 [2013-09-16]. ^ Witchalls, Clint (18 August 2010) Nobel prizewinner: We are running out of helium. New Scientist. ^ Szondy, David. We may not be running out of helium after all. www.gizmag.com. [2016-04-01]. 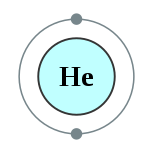 ^ Press release: The unbearable lightness of helium.... EurekAlert. European Association of Geochemistry. 19 August 2015 [2016-04-01]. （原始内容存档于6 September 2015）. ^ Sample, Ian. Huge helium gas find in east Africa averts medical shortage. The Guardian. 28 June 2016. ^ Kochhar, R. K. French astronomers in India during the 17th – 19th centuries. Journal of the British Astronomical Association. 1991, 101 (2): 95–100. Bibcode:1991JBAA..101...95K. ^ 15.0 15.1 Emsley, John. Nature's Building Blocks. Oxford: Oxford University Press. 2001: 175–179. ISBN 0-19-850341-5. ^ 16.0 16.1 Clifford A. Hampel. The Encyclopedia of the Chemical Elements. New York: Van Nostrand Reinhold. 1968: 256–268. ISBN 0-442-15598-0. ^ Sir Norman Lockyer – discovery of the element that he named helium 页面存档备份，存于互联网档案馆" Balloon Professional Magazine, 7 August 2009. ^ Helium. Oxford English Dictionary. 2008 [2008-07-20]. ^ Stewart, Alfred Walter. Recent Advances in Physical and Inorganic Chemistry. BiblioBazaar, LLC. 2008: 201. ISBN 0-554-80513-8. ^ Ramsay, William. On a Gas Showing the Spectrum of Helium, the Reputed Cause of D3 , One of the Lines in the Coronal Spectrum. Preliminary Note. Proceedings of the Royal Society of London. 1895, 58 (347–352): 65–67. doi:10.1098/rspl.1895.0006. ^ Ramsay, William. Helium, a Gaseous Constituent of Certain Minerals. Part I. Proceedings of the Royal Society of London. 1895, 58 (347–352): 80–89. doi:10.1098/rspl.1895.0010. ^ Ramsay, William. Helium, a Gaseous Constituent of Certain Minerals. Part II--. Proceedings of the Royal Society of London. 1895, 59 (1): 325–330. doi:10.1098/rspl.1895.0097. ^ （德文） Langlet, N. A. Das Atomgewicht des Heliums. Zeitschrift für anorganische Chemie. 1895, 10 (1): 289–292. doi:10.1002/zaac.18950100130 （德语）. ^ Weaver, E.R. 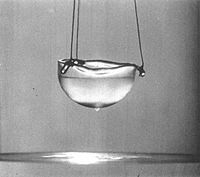 Bibliography of Helium Literature. Industrial & Engineering Chemistry. 1919. ^ Munday, Pat. John A. Garraty and Mark C. Carnes, 编. Biographical entry for W.F. Hillebrand（1853–1925）, geochemist and U.S. Bureau of Standards administrator in American National Biography 10–11. Oxford University Press. 1999: 808–9; 227–8. ^ van Delft, Dirk. Little cup of Helium, big Science (PDF). Physics Today. 2008: 36–42 [2008-07-20]. （原始内容 (PDF)存档于2008年6月25日）. ^ Coldest Cold. Time Inc. 1929-06-10 [2008-07-27]. 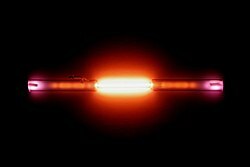 ^ Kapitza, P. Viscosity of Liquid Helium below the λ-Point. Nature. 1938, 141 (3558): 74. Bibcode:1938Natur.141...74K. doi:10.1038/141074a0. ^ Osheroff, D. D.; Richardson, R. C.; Lee, D. M. Evidence for a New Phase of Solid He3. Phys. Rev. Lett. 1972, 28 (14): 885–888. Bibcode:1972PhRvL..28..885O. doi:10.1103/PhysRevLett.28.885. ^ 余恒. 被遗忘的元素用字. 中国科技术语. 2013, 15 (6): 53–55 [2014-03-20]. ^ Dong, Xiao; Oganov, Artem R.; Goncharov, Alexander F.; Stavrou, Elissaios; Lobanov, Sergey; Saleh, Gabriele; Qian, Guang-Rui; Zhu, Qiang; Gatti, Carlo. A stable compound of helium and sodium at high pressure. Nature Chemistry. 2017-02-06, 9 (5): nchem.2716. doi:10.1038/nchem.2716 （英语）. ^ 毛泽东水晶棺造价不菲用35吨天然水晶制成. 新闻午报. 东方网. 2005-09-21 [2011-07-02]. ^ 日綜玩出禍 12歲女星吸氦氣昏迷不醒. 中時電子報. 2015-02-05. （原始内容存档于2015-02-08）.